Mav, you're a saint. Thanks for putting this together. Your welcome! Just trying to give all our members a wonderful & safer trip. -The snowline and quality of the snow really varied according to the orientation of the land and the sun. When I went up Silliman, the snow started at 9500. But Colby Lake at 10584 was clear as an August day. I came down a pass to the southeast of Copper Mine Peak, not the north one that is shown on the HST map, and it was steep and required the axe. I noticed one fresh pair of 12 point crampon tracks lower down the snow incline; whoever it was chose to ascend up the rocks that looked too sketchy to me. The long descent down into Cloud Canyon was in the afternoon and the post-holing the most nerve-wracking. Most of what I show is already a week old, and everything was melting fast. Still, waiting at least one more week might make for a less difficult trip. Climbed Koip Peak on Saturday from the Mono Pass trailhead to Parker Pass to Koip Pass. A little swampy in the last mile to Parker Pass. From Parker to the bottom of the Koip switchbacks, some snowfields, but all low angle/safe to cross (though make sure you're not on any snow bridges). Switchbacks up to Koip were clear, but then had to cross maybe ~5 short, steep snowfields to get to the top of the pass. Used my axe, but you can also scramble around if you're ambitious. More snow still out there than I was expecting. Hey guys! Did a last minute trip up Duck pass last weekend. It was gorgeous!! A little snowy at the pass, but pretty clear steps to follow, without any sort of spike or snowshoe. & we had Pika lake all to ourselves! The only mosquitoes were at Barney lake. Don't stop when you walk through there in the evening.. if camping, hike up into the hill a bit & you'll be fine! We visited Vandenburg Lake (from Norris/Fernandez) this weekend - some snow patches around 8600, pretty solid around 9200-9500 on north aspects. Mosquitos were out in force. Maverick, thanks for posting so many reports from other sites. But what is "SNCC-TPP"? Google doesn't know the answer. 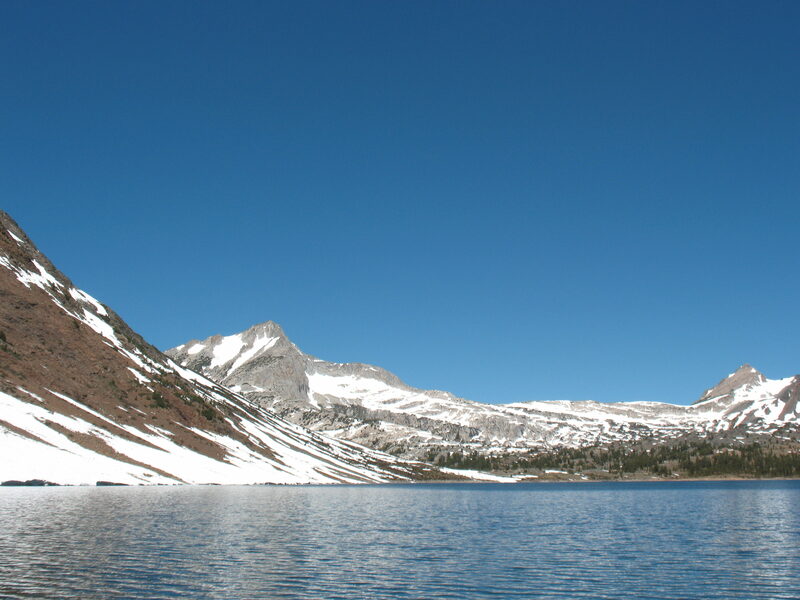 Sierra Nevada Current Conditions-Trails, Passes and Peaks on Facebook. Climbed the Dana Couloir on 6/17. Great early morning (7am) snow conditions after a freeze the night before. Wild flowers in full bloom, great weather, creek flows raging then tailing out near the end. Spare patches of snow at 8000 feet and above. Either go very soon or wait until fall. I think July may be too hot (you get double sunlight for the reflective granite).